Lydia Mae Stewart departed this life on Sunday, June 1, 2014, at the age of 72 years, 4 months, 2 days. She was born in Louisville, Kentucky on January 30, 1942, the daughter of the late Charles Muncy and Grace (Reba) Stephenson Simpson. Lydia was a secretary for Newaygo Cement & Gravel in Newaygo, Michigan. She had also worked at the Novi Chamber of Commerce in Novi, Michigan; Newaygo Chamber of Commerce in Newaygo, Michigan; was a notary public in Michigan; and was a volunteer at Hardin County Jesus Cares. She loved painting and volunteering for different organizations. 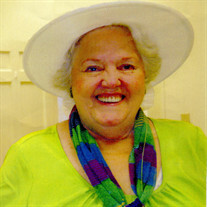 Lydia was a member of the First United Methodist Church and was an Eastern Star. She is survived by her children, Leah Steele of Savannah, Tennessee and Edward Bearden of Columbia, South Carolina; grandchildren, Melinda Hassan, Stephanie Karr, Thomas Edward Karr, Sarah Elizabeth Bearden, Keelan Bryant Bearden; great-grandchild, Jeremiah Sheldon; and brother, Daniel Kindlle of Milford, Michigan. In addition to her parents, she was preceded in death by her brothers, Ted and Edward Simpson. Click here to see Lydia's last Profile entry.